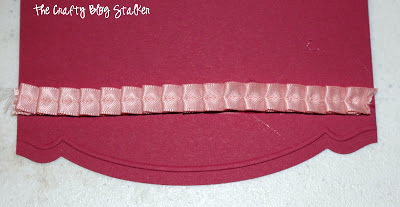 Make a fancy pennant name banner using cardstock and lots of fun embellishments. An easy DIY craft tutorial idea to use as party decor or home decor. All of my friends are crafty but we rarely get together to craft. Recently, I found a weekend that none of us had plans and came up with a fun craft that we could all make together. A fun Decorative Word Paper Banner. All of the supplies we used came from Stampin’ Up!. Their products are constantly changing and that means most of the products we used are no longer available. 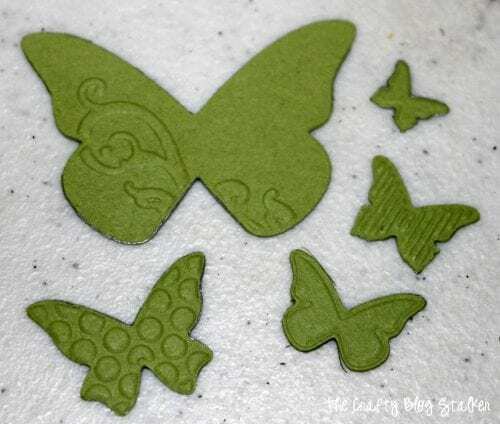 But similar products can be found at Stampin’ Up! or Amazon. We started on the flag pieces on the banner and used Adorning Edgelits and matching Embossing Folders from Stampin’ Up! to give it a cool edge. Glued some Pleated Satin Ribbon just above the embossing. 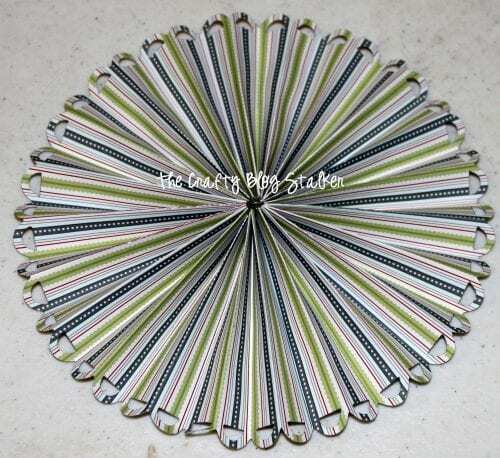 Made a cute paper rosette using Designer Rosette Bigz XL Die. 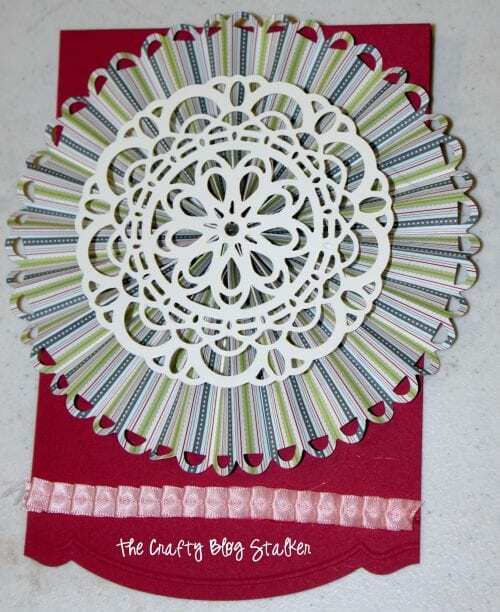 Cut a white doily using Paper Doily Sizzlit and stacked each on top of the other and glued together. To embellish I cut flowers with the Beautiful Wings Embosslits folder and used Basic Pearls. We all had so much fun making our banners our own and it was fun to see the different things that everybody added to their own. We all had to laugh because one of my friends accidentally put her banner together backwards so she refused to have her picture taken but the rest of us thought it was too funny not to take a picture. What do you think we should do for our next craft day? Share and leave a comment below! 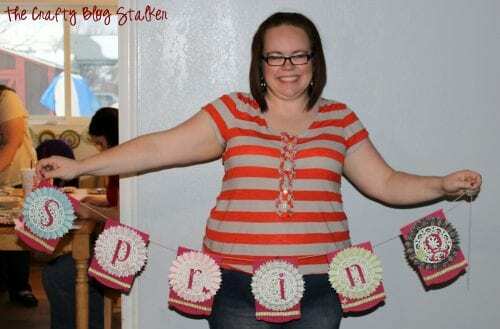 SAVE HOW TO MAKE A DECORATIVE WORD PAPER BANNER TO YOUR FAVORITE PAPER CRAFTS PINTEREST BOARD! 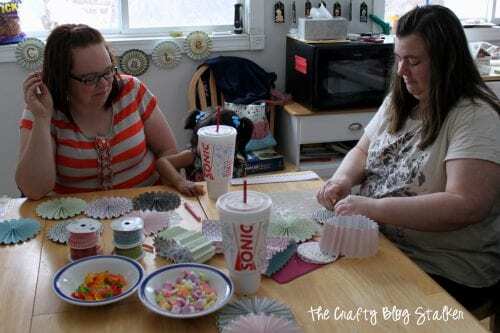 What a great idea for a craftym get together!!! Love banners, buntings, garlands. Awesome. Looks like so much fun and they all came out gorgeous! Even the backwards one! Thanks so much for linking up to Creative Thursday this week. This looks like a fun project to do with friends. They are all beautiful! I can’t wait to see what you link up next week. Have a wonderful weekend. It sounds like you ladies had a great time! The backwards banner is definitely something I would do. Thanks so much for sharing at Whimsy Wednesdays. Oh how fun!! Your banners turned out beautifully, I just love them. I will be featuring them tomorrow at our party. I must say I am totally jealous of your craft night. Thanks for sharing with us at Link It Up Thursday. Those banners turned out cute! I need a craft night with friends. Thanks for sharing at Terrific Tuesdays. I’m loving the banners (even the cute backwards one…guessing she fixed it?). Love the idea of having a craft get together…something for me to think about! Thanks for sharing your project and inspiration with us @ “Toot Your Horn Tuesday”. Can’t wait to see what you link up this week! Thanks so much for sharing, Katie. This is so dang cute! I’ll be featuring this on my party highlights this week!